A gold necklace clasp, dating to the Roman period. 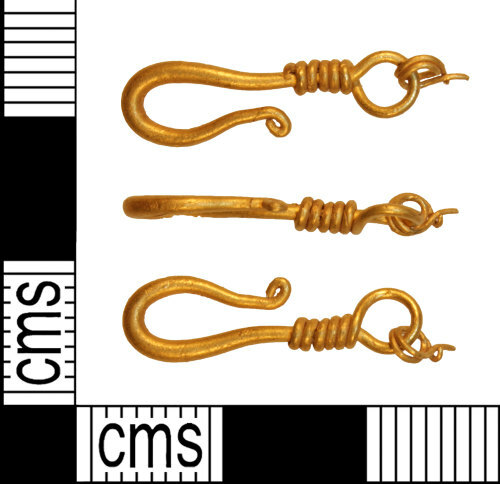 The clasp comprises a single circular-section tapering piece of gold wire which has been bent at one end to form a hook. The terminal has then been bent back on itself to create a decorative curl. At the other end, the wire has been bent into a loop, with the loop secured by wrapping the wire around itself six times. Threaded through the loop is a fragmentary further chain link formed from two pieces of circular-section gold wire. The clasp measures 19mm in length, 5mm in width at the loop end. The clasp weighs 0.91 grams.